Your DeWitt watch is guaranteed free from all manufacturing defects for a period of 24 months from the date of purchase. 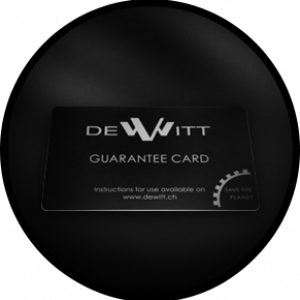 In order to benefit from this guarantee you will be required to present your DeWitt guarantee card that was duly completed, dated, signed and stamped by an authorised DeWitt retailer at the time of purchase of the watch. Defects and damage resulting from negligence or accidents. Defects and damage caused by incorrect or abusive use (knocks, dents, crushing, moisture in the case of non- water-resistant watches), alteration or repairs not performed by an authorised DeWitt after-sales-service centre. Theft or loss of the complete watch or components. This guarantee is subject to Swiss law.